When we regard any kind of artwork today we can identify a plethora of references: Art historical, cultural, societal, some visual. How can we contemplate what an artwork is about while at the same time see what it is? How do non-visual references influence, not what an artwork looks like, but how we see it? How do we know what something is about? How do we inform ourselves as viewers to be educated enough to know what we are comprehending when viewing an artwork? These are questions that immediately run through my mind when I look at art, especially Robert Egert’s and I have been looking at his work throughout his entire career. Is what we see a story, a satire, a microscopic enlargement, an analysis of DNA or patterns taken from a satellite view? Robert Egert is an artist who thrives from many arteries. When I met him during foundation year at Pratt Institute I was impressed that he was born and bred in Brooklyn. Still, I don’t know if I was more impressed by his knowledge of Greek and Roman myths, I think they kind of balanced each other out. This is important. 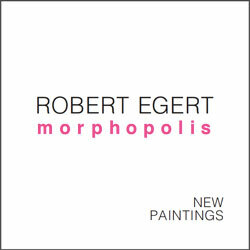 This is important to be able to see Robert Egert’s work. He is grounded in the here and now, with a knowledge that runs through antiquity to contemporary science fiction. I don’t want to be too specific, but we can talk about Rhizomes, fracking, Pan, the Loreley, Russian cinema, the Golden Age, artificial intelligence and gun control. All kinds of things are in his head when he paints. He thinks a lot when he works. He doesn’t make it easy on himself. The arteries that nourish his system can contradict each other, can almost cancel each other out, only to join together to strengthen each other. His work has evolved from narrative to abstract to abstract narrative. It is fluid in an overlapping viscous kind of way. 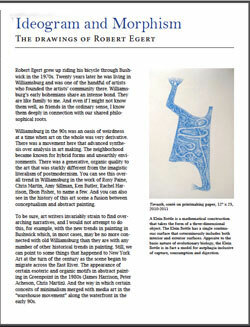 Robert Egert’s fluidity develops from a concept. This is no flimsy use of the word. At Pratt in the seventies we enjoyed a rigorous education in minimalist and conceptual art, both in theory and practice. This underlies Robert Egert’s work no matter what it looks like. His early painting moved from constructed spatial objects to new takes on Ovid’s Metamorphoses. In the early 1980s when the East Village was hip and dangerous, I saw his exhibition at Civilian Warfare. 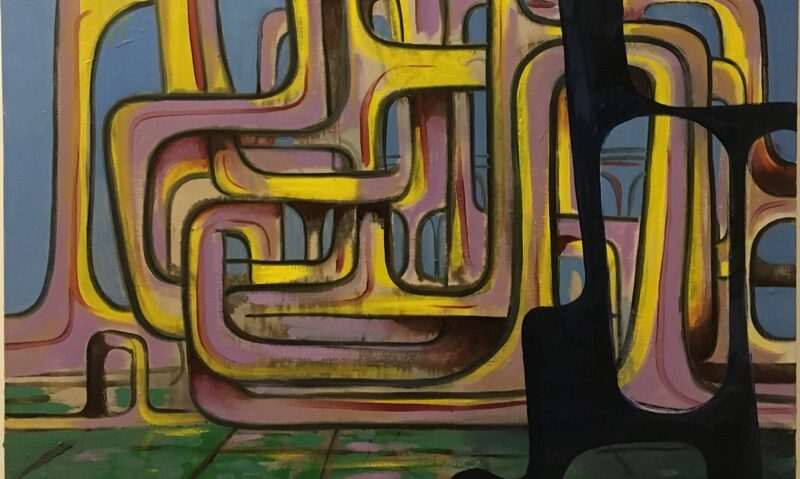 His paintings were large oil canvases, vernacular objects floated amidst a color field ground, weird perspectives generated a sense of insecure place. These works referenced the uncertainty of the times, a change in value systems, a world drifting towards an ambivalent future. Years before artists like Neo Rauch appeared on the scene, Robert Egert was making paintings that collaged the mundane with the historical in a mix that said something about contemporary politics. Manifesting duplicity by referencing nostalgia, his work pinned down the eclecticism of the time, making images that were complex and unapologetic. Since then Robert Egert’s work has evolved to be more pondering, while reductive, dealing with questions that go beyond the contemporary. The years following the heady days of New York in the eighties took him in many directions, Robert Egert went on to study philosophy and sociology, founded a family, wrote for art journals and has had a good look at corporate America. Inevitably, his approach to painting has become more encompassing, while his practice incorporates experience gained outside the hermetics of the art world. His work revolves around questions like: What is life flow? What is humanity? The sense of searching to make humanity palpable without obvious visual cues is a quest that Robert Egert has set out upon. When we look at the shapes in Robert Egert’s paintings we see patterns interlocking and overlays of color, sometimes we become aware of a figure. Is it human? Put simply, Egert’s paintings can be seen as a cartography of humanity. The body is ephemeral, fleeting and appearing, drifting and separating. The interchange of foreground and background is reminiscent of mutating cells. Yet there is also an all encompassing skin. Is this a view from a petri-dish? Once again we see the flux from macro to micro, an interweaving of space in which scale becomes a nonissue. If scale is a nonissue, we are directed to specific ideas that are important to Egert by his use of titles. Concepts that Octavia Butler developed in her trilogy „Lilith’s Brood“ have occupied Egert while completing his most recent work. „Her books posit interbreeding between an alien society and humans in the wake of a nuclear holocaust that essentially wipes out humans and destroys the earth. The aliens that come to save the few survivors on earth interbreed to create a new hybrid species.“ Interbreeding, an attempt at rescuing while eliminating the original, all these thoughts connect Robert’s new work to his past work in regard to his concerns with dystopian society. Perhaps we could call Robert Egert’s painting contemporary action painting, however not the kind of action painting by which the body directs the artist’s movements and marks made on the canvas. In Egert’s paintings the gesture is removed from the maker, it becomes a kind of meditative, autonomous painting, a kind of painting that is more related to the European tachisme than American action painting. The German informel artist Bernhard Schultze comes to mind with his figures wavering between human and animal forms. And so we return to the questions one asks oneself when looking at an artwork. When does the decorative become something else? How can an artist translate the complexities of our being into paintings that are not just to be looked at? It comes down to the fact that we understand very little when we first look at an artwork. Therefore, if we see what we know, isn’t it better to know a little more? This is what makes us human. Or is it? This is the question that Robert Egert will continue to pose and continue to offer, at least partial, answers to. tachism: a style of painting adopted by some french artists around the 1940s, involving dabs or splotches of col, a process of action and reaction. MICHAEL: Hey Robert! I love your work. Most of what I’ve seen on your website seems to harken back to modernism. I see a lot of modern era artistic influences, yet your work is obviously contemporary because it’s being made today. Thoughts? ROBERT: We’re all the product of our times and I grew up with modernism and minimalism as overbearing ideas. The question of how a painter could make a painting in a post modern world was a key question among many of us. I guess it still is, though I think it’s less fraught today because the art world has gotten so much bigger and more varied that we’ve become more accepting of diversity. In that framework, modernism was seen as a kind of inevitable, historic trajectory that could be traced from the impressionists through the moderns and finally into the end game of the minimalists. It was a purely formal and almost entirely Western framework and I suppose it was globalization that brought it crashing down. But you can still see vestiges of it if you go through the MOMA permanent collection. A steady drum beat through the 20th century of ever flattening pictorial space, increased focus on materiality over illusion and the solemn elimination of inter-subjectivity and emotional content. In my own work, I suppose I still wrestle with these questions. They still seem relevant to me – most of the time at least. I think a lot about the idea of the individual in art and how subjectivity gets expressed. I still think that’s a valid area to explore. MICHAEL: The idea of the individual … is that what drives your lone, figurative pieces? They’re very warm and painterly. ROBERT: Yes. Very much. And I’d also add that my figurative work and my abstract work couldn’t be more different. The thing about my figurative work is that it is immediate and personal. The models only hold their poses for a few minutes, so you have to work quickly and be fully present in the moment. There’s little opportunity to think before acting. The abstract work is built up over time and I carefully consider each layer and color choice with care. I guess we all have the capacity to express ourselves in multiple ways. When I first started to paint the figure, I kept the results to myself because it seemed like it might be a confusing or even an undermining thing to show those to people. Again, I think that’s because of the rigid conceptual framework that I grew up with. In those days, we used to say that if you changed your style you had to change your friends. That’s really old school now and there’s a greater acceptance of diversity (or a lack of intellectual rigor), though I’m not sure if they’re mutually exclusive. MICHAEL: I hate to mention other artistic influences when I’m chatting with a living artist, so I won’t. However, I do like the organic, cut out quality of your abstracts. They’re almost like organisms. What makes you paint this way? ROBERT: It started with the idea of organs. Internal organs. I was looking at medical diagrams and thinking about how the human body is smooth, simple and symmetrical on the outside and yet so complex and asymmetrical internally. I did a series of drawings in blue conté that combined very simple organic outlines that were filled with incredibly complex, almost baroque guts. I spent three or four years working on those drawings and was lucky enough to have a chance to exhibit them quite a bit. After a few years, I felt the thread had run its course and switched to painting larger works, but my interest in those shapes persists. I can’t really say that they refer to organs any more, but the overall quality allows me to fill the shapes with a presence or sense of being an organic whole. Once I start working, I find that I am never satisfied and actually love making changes over and over again. If left unchecked, I’d never finish a painting so my solution was just keep adjusting. That’s where the layers come in. Each layer is something of a refinement over the prior layer. MICHAEL: How large are some of your works now? I once spoke with an artist who said he thinks large, overscaled works can be misleading because they may trade technique for wow factor. I’m not saying you are doing that. Just wondering how you view scale. ROBERT: Great question. I agree that scale can mislead, but more importantly, scale determines what part of your brain is engaged. For someone painting or drawing, scale determines whether you stand or sit when producing art. I’m convinced that standing engages entirely different parts of your brain than when you are sitting. Standing also changes the character of your movement, your sense of scale and balance. Once you bring it to the forefront of your consciousness, you realize how significant it really is. I used to make large paintings – like, six feet by five feet in size. Now I keep it closer to three feet maximum dimension. Part of it is, like you suggest, large scale can seem so important. But the truth is that unless you are selling most of your work, producing lots of really large paintings just becomes a big expense and a storage burden. MICHAEL: I totally understand, but I love BIG art. Are you a full-time artist? Do you paint every day? What’s your daily routine like? ROBERT: I love big art too, but it is also easily seductive. Just imagine looking at a six foot by six foot monochrome painting. It captures almost your entire field of vision and it’s powerful by scale alone. That cinematographic effect might be just too easy. ROBERT: I am a very disciplined artist and I balance studio time with a full time job. My job requires that I travel a lot. In the last month, I’ve traveled by air six times in the U.S. and Europe and that’s made it challenging to stick to a routine. The truth is that even when I was a full-time artist I didn’t produce any more work than I do now. It’s all grist for the mill, as they say. And it’s important to be flexible. MICHAEL: Robert, I think a lot of artists out there will be thrilled that you’ve said that. ROBERT: There are a lot of people in the arts who have financial support and they don’t discuss it, of course. I’m proud of the fact that I’ve been able to do well at a good job that I enjoy and pursue the arts. Of course, I used to wish for greater commercial success as a painter and perhaps I will attain that one day and be able to leave my day job. But the art world as a commercial environment is not particularly attractive either. There are a lot of bad actors out there too. MICHAEL: Yes there are. Do you see a connection at all between the lack of arts education in schools and the plight of living artists? ROBERT: Absolutely. Highly valued contemporary art has become a currency traded by the ultra rich. In the blue chip system, scarcity is created by limiting value to only a few artists, and the value is associated with the identity of the artist and not necessarily the work itself. ROBERT: The entire system rests on a massive base of struggling artists and couldn’t exist without it, yet the base is powerless. And they undermine their own power further by aiding in the gentrification process and making it even more difficult to sustain themselves in the city. ROBERT: Take the Bushwick art scene as an example: It has become so self involved with its identity as a neighborhood vs. any significant approach to art-making that the dominant result is an increase in real estate value. It sometimes feels like artist run galleries showing art to artists and that makes for a very supportive and tight knit community, but you don’t have to dig too deep to find the investors and they are mostly into real estate. But getting back to your question, perhaps a bigger investment in arts education would produce a broader base of art consumption, one that could be a viable alternative market to the art mafia. But for that to happen, art buying would have to be driven by desire for the object vs. speculation and status. MICHAEL: Given all of that, combined with the world obsession with digital/mobile/cellphone technology now, it seems to me that art should become even more highly valued, but then I also wonder whether people with shorter attention spans will put painting in the same category as watching grass grow. ROBERT: Hard to say. I don’t think anyone believes that hand-made art objects will disappear, but as I see it, the factors that make some objects celebrated and highly-valued are speculative in nature. Most artists I know read blogs, but it’s perhaps more to the point to read art market news which looks at art in the same way that finance blogs look at stocks and bonds. No mention of aesthetics, concepts or theory – just the resale value. That’s real capitalism where you replace anything and everything with a dollar value. People are still enchanted by ideas and art, but to your point, we’re increasingly influenced by trends vs. our own individual interests. All you have to do is ask people what music or clothes they like to realize that most people have no personal opinion, but simply consume what’s offered and think that it’s a form of personal choice. Last night I had a discussion with a photographer who works with film in a darkroom and I asked him how he felt about the explosion of digital photography. He thought that people needed to develop a greater awareness for the subtleties of hand-developed film. I didn’t want to upset him, but it seemed very unrealistic to think that the public would develop an interest in film anymore than they would develop an interest in daguerreotypes. ROBERT: Some new digital businesses have sprung up that allow collectors to rent art for a period of time to hang in their homes. They can keep it and pay a fee by the month and when they get tired of it, they can swap it out for another piece. I don’t think they’re doing very well, but I thought it was an interesting model. MICHAEL: I’d like to support anyone who is trying to expand the contemporary art audience. It just seems that it usually involves art people chatting with art people like we’re doing right now. However, I still think that it’s in the best interest of the entire art world to expand despite the so- called art mafia. Yet to me, everyone seems to be complicit in some way in their support of the old model that’s only benefitting maybe the top five percent of the art world. What do you think? ROBERT: I totally hear you. Sometimes it feels like there’s no escape. I think that’s the nature of our economic system. It expresses itself in social relationships! I recently got involved with an exhibition space in Hoboken that’s closer to a loft party scene than a gallery. Instead of a white box with perfect walls and lighting, it’s a dark, comfortable space filled with sofas, live music and a decidedly un-art world crowd that really looks at the work and sticks around to talk about it. The opening was very well attended and people stayed well past midnight. Despite this, the curator commented to me that virtually no one from the Brooklyn “art scene” had come. I laughed and said that maybe we were creating our own scene. But what would be even better would be to mix them up. To answer your question, I agree, we’re all complicit in some ways. I’ve caught myself being an art snob, especially when confronted with uninformed, but popular art. That’s a hard nut to crack. In one sense, we need to strive toward generosity and inclusion. On the other hand, we need to uphold a sense of quality and theoretical rigor. The problem is that most “high art” has become completely dependent on the big bucks. MICHAEL: Were you guys really expecting people from Brooklyn to travel to Hoboken for an opening? By the way, do openings still excite you? What is it about show openings? They’re loud and social which is great, but I always end up going the week after so I can actually spend time with the art undistracted. ROBERT: To be completely honest, I was afraid there’d be no one there at all. But we had a good turnout. I’ve accumulated friends on the other side of the river over the years. They never bother to come to my openings in Brooklyn, so I guess this evens things out. I enjoy openings, but I don’t know if they excite me anymore (unless I’ve got work in the show). More than anything else, openings put me in touch with other artists. Especially in Brooklyn where I grew up and spent so much of my life – it’s a chance to reconnect. It can be hard to take in the art at an opening because, let’s face it, most art is less interesting than people. I always say I’m going to go back, but rarely do. Mostly because of time constraints. MICHAEL: I dare say that these days when many people hear “Hoboken,” they might think of “The Sopranos” or a place where people who can’t afford to live in New York City live. I’m sure there’s more to Jersey than that, No? Yes Robert, this is your Chamber of Commerce moment for Jersey. LOL. ROBERT: Well, Hoboken is the Brooklyn of New Jersey. MICHAEL: Hoboken is the Brooklyn of New Jersey? Haha. ROBERT: In every way. Including a massive drunken wall street scene on Friday night similar to what DUMBO (Note to reader: DUMBO is an artsy section of Brooklyn, New York. DUMBO is an acronym for: Down Under the Manhattan Bridge Overpass) has become. I’ve lived in practically every NYC neighborhood about five to ten years before it took off. I never made a killing in real estate so that either means I’ve been too early or just focused on other things. I lived in the East Village in the eighties and then in Williamsburg in the nineties. Some of my old neighbors are still in the same place all this time and I suppose they’ve become real estate rich as a result which is great for them. On the other hand, I can’t imagine staying in the same place for so long. We move very frequently and never seem to settle down anywhere. I can’t do the Chamber of Commerce thing because I’m not a big fan. There are some strong cultural communities outside of NYC, but they tend to be over an hour away. They have to be far enough that they can escape the orbit of NYC. I hear good things about Easton, PA, Yonkers, Detroit, Hudson and Newburgh. There are probably others too. But having spent some years in rural America, I can tell you it takes time to find your community. MICHAEL: Back to your work. When you’re in front of the canvas and painting, what’s going through your mind? What are you thinking? Is the process more intellectual, emotional or spiritual? ROBERT: All the intellectual stuff happens before and after. When I’m actually painting, I listen to the forms. The forms let me know if the color is right or if it needs to change. If they need more meat on their bones or if they feel energetic, lethargic, hungry or stressed. And if they’re mute, I go away and come back another time. When they stop talking altogether, then I know it’s time to change my approach and do something else. MICHAEL: What’s the point in creating so much art when most people don’t even visit art galleries let alone buy art? So many artists have huge stockpiles of unsold if not unseen art. What the answer to this? ROBERT: I’m not sure there’s much point in creating art that no one will see, unless the maker gets some satisfaction from the process of making it. I’ve been lucky enough to be able to exhibit my work, plus today, many artists share their work on social media, so even if they don’t have gallery venues, they can still develop an audience of sorts. I suppose this is why artists congregate, because without an audience, you run the risk of feeling rather destitute and pointless. I find the stockpiles to be incredibly sad and I edit my own work furiously to keep the backlog slim. I’ve also destroyed work that I felt was just too onerous a burden and lived to regret that. Another solution for artists that don’t sell much of their work is trading and gifting work. In the last couple of years, I unexpectedly ran into older pieces of mine at parties and once in a doctor’s waiting room. It was a wonderful feeling seeing my work out and experienced in a real setting. Art’s not utilitarian and a focus on the commodity may not be entirely productive. But if this question really irks you then I’d say switch to digital formats and then you can keep all your work with no physical footprint at all. MICHAEL: I find it odd how entitled most people feel with regard to art. People really take it for granted. Robert, I could chat on with you, but I’ll make this the last question. Before art historians or curators interpret your work long after you’re gone, what do you want to say about your body of work? Is there a message? ROBERT: I can’t honestly say that there’s a single message that runs through all my work, but I can say that there’s an aspiration. I am trying to create images that reflect of our experience of the world. To reveal patterns, create fantasies, microcosms and perhaps a visual island of playfulness, stability or balance suspended in this messy world.